The West Seventh neighborhood, also called the “West End,” has drawn a great deal of interest in recent years as a place for people to live and work and start a business. Our environment of historic buildings for homes and businesses on the bluff of the Mississippi River is becoming a local destination. Even during the downturn of 2008, new ventures continued to give the neighborhood a try. Large-scale developers have noticed the opportunities, and significant projects have and will continue to be proposed for our real estate market. In 2013, the city completed and added into its comprehensive plan a suggested framework for the city to re-engage with the river. The Great River Passage guidelines were developed to foster the themes of more natural, more connected and more urban, to further the goals of facilitating enhanced use of the National Park at our doorstep. In this developing context we are not without problems. At the request of the Fort Road Federation, the city has begun to study parking in the neighborhood. We at the West 7th Business Association have attended meetings, talked with residents and our members for their perspectives. Following the recent community meeting at Bad Weather Brewing, we e-mailed our membership referencing your presentation, and solicited members’ further comments and ideas. With all of this in mind, we wish to offer the following thoughts for the study team to consider. 1: Consistent time-limited parking regulations/signage (e.g., “X hour(s) except by permit”) across the neighborhood should be adopted and clearly posted. For example, multiple rules and confusing signage exists on Smith, and the lack of time-limited parking elsewhere in Area 7 places greater parking burdens on Goodrich where two hour parking except by permit now exists. 2: Parking restrictions should accommodate the needs of homeowner parking near their home without giving up the option of shared use when not needed. 3: Improved neighborhood-supported and flexible public transit should be implemented as soon as possible to expand transportation choices and mitigate parking pressures. • Consistent and stepped-up enforcement of time limited parking. • Reclaim parking at abandoned curb cuts. • Reclaim parking by changing legacy parking restrictions no longer justified. • Maximize on-street parking availability by following a case-by-case analysis, allowing parking within 30 feet of stop signs where sight lines to crossing traffic are not affected and safety is therefore not impacted. • Transit improvements and regulatory changes should be made that discourage frugal short term parking by outside temporary parking users that take away parking in the neighborhood. 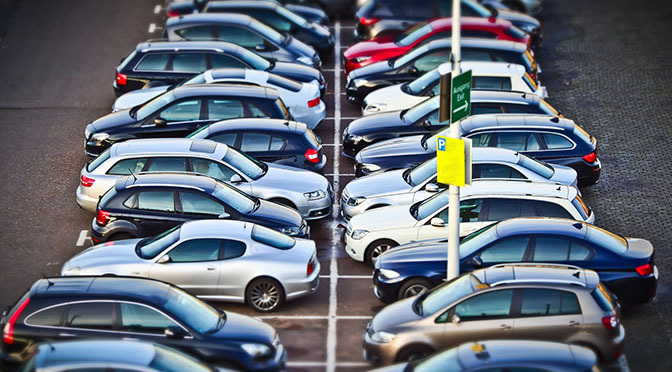 5: With the high cost of surface parking lots and even higher cost of structured parking, every single parking space added to capacity is valuable and needed. 6: High-demand parking users, especially near to downtown, must be encouraged to serve their entire customer parking needs to help avoid spill-over into adjacent residential neighborhoods. Mitigating customer parking costs, shared parking and encouraged use of public transit are options. 7: As on-street public parking is exceeded by demand, the addition of appropriately sized and located public structured parking must be considered. Public incentives to private owners could encourage shared use of existing structured parking. Examples of in-building structured parking for users abound in the city. The private parking ramp at United Family Medicine is an example. The structured parking cited as needed by Ryan Cos. for the new Ford Development and recently endorsed by the Highland District Council and the St. Paul Planning Commission is another. 8: All avenues of technology should be explored. If there is an idea, can an “app” help? One technology we suggest be explored is vehicle recognition software. A combination of the software and standardized time limited parking, could be implemented with active enforcement to free up unused daytime parking where banned with paid permits only is currently the case. Permits could be offered for free as a part of the program. This technology could be explored as a replacement for metered parking. Since this technology could be operated by an enforcement officer in a vehicle, we won’t have the absent enforcement officer constitutional problem. Although not exactly what is needed, here is an interesting application of vehicle recognition at orpix-inc.com/vehicle-recognition. We appreciate the opportunity to offer our comments and will be available to expand on these suggestions as requested.